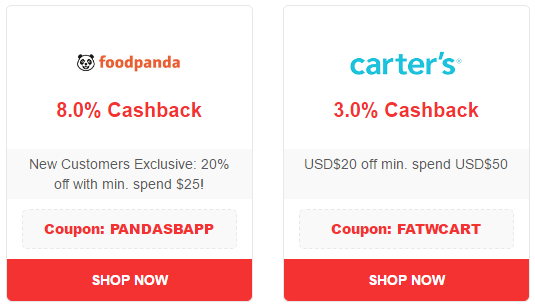 ShopBack: Redmart coupons, cashback and more! A lot of friends by now know that I had fell in love with online shopping. During confinement, I was confined at home and unable to go out to shop for stuffs, thanks god for the invention of internet + online shopping, I am able to order my grocery from Redmart. I was having a hectic working schedule not too long ago but I managed to order G’s birthday present via Zarola as well. Online shopping is definitely one of the greatest invention, and it save my sanity as a busy working mum who is always racing against time. Recently, I was invited to do a review on the online shopping rewards site: ShopBack Singapore. Initially, I thought it as just another shopping site, but I realised it is more than that! Apparently it’s pretty easy to earn the cash back, all you need to do is to register for a ShopBack account, choose a merchant and the type of offers you are interested, and click on “SHOP NOW” to continue with your online shopping as per normal. Once your purchase transaction is verified to have completed, members will find the cashback in their ShopBack account. While writing this post, I have already start to do my grocery through online shopping with Redmart coupon codes at the same time! You can find more coupons from other merchants here. From 3rd Jun 2016 to 14th Aug 2016, ShopBack will be offering more cashback than normal during the Great Singapore Sales! One can save up to 90% more, with up to 40% increased cashback offered by merchants such as Zalora, Burger King, and also other great deals and offers like a FoodPanda voucher. You can read more details on the offers for GSS on their website. Wonderful review. I like it, Thanks for sharing.